One method calls for the division of a stock portfolio into domestic and foreign, and then into different styles: large cap, small cap, mid cap, value, and growth. The other method calls for allocating percentages of a portfolio to various industry sectors: healthcare, utilities, energy, financials, and so on. 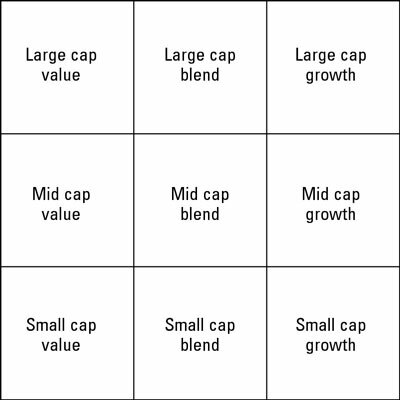 Most savvy investors have some equity in each box of the style box or grid (aka the Morningstar grid). A number of ETFs are available to match each style. The reason for the style box is simple enough: History shows that companies of differing cap (capitalization) size (in other words, large companies and small companies), and value and growth companies, tend to rise and fall under different economic conditions. Morningstar has tracked how well various investment styleshave fared in the past several years. Note that a number of ETFs are available to match each style. The advent of ETFs has largely brought forth the use of sector investing as an alternative to the grid. Examining the two models toe-to-toe yields some interesting comparisons — and much food for thought. One study on industry-sector investing, by Chicago-based Ibbotson Associates, came to the very favorable conclusion that sector investing is a potentially superior diversifier to grid investing because times have changed since the 1960s when style investing first became popular. “Globalization has led to a rise in correlation between domestic and international stocks; large, mid, and small cap stocks have high correlation to each other. A company’s performance is tied more to its industry than to the country where it’s based, or the size of its market cap,” concluded Ibbotson. The jury is still out, but you can do a little comparison of your own by comparing the data on style performance to the data on industry performance included in this article. Note that by using either method of diversification, some of your investments should smell like roses in years when others stink. Also, recall that all stocks crashed in 2008 but recovered at significantly different paces; this is true of various styles and sectors. And it is certainly true for various geographic regions. As measured by their respective Dow Jones indexes, we can track how well various industry sectors fared in recent years. Yes, there are ETFs that track each of these industry sectors — and many more.